New Space Telescope Will Outdistance Hubble A model of the James Webb Space Telescope is touring the country. The real telescope will be sent to a spot nearly 1 million miles away. It's job is to capture the most penetrating images yet of the early universe. A model of the James Webb Space Telescope is currently touring the country. Here, the telescope is set up for a conference in Orlando, Fla. The Hubble Space Telescope has given scientists unprecedented images of the universe. 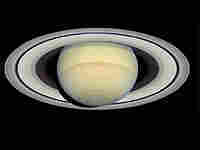 But Hubble is growing older; it's been orbiting Earth for 17 years. And astronomers are never satisfied. They're working on an even bigger space telescope. Unlike Hubble, which sits right next to Earth, the James Webb Space Telescope is going to be sent to a spot nearly a million miles away. Scientists started planning this ambitious telescope about 20 years ago. Peter Stockman, head of the James Webb Space Telescope Mission office at the Space Telescope Science Institute in Baltimore, says that, a decade ago, when he would show people sketches of the idea, they were mostly not impressed. "They would giggle. I think it made them nervous," Stockman recalls. "Nervous like, 'This will never work.' They had no faith that such a thing could be done, and they had some reasons." After all, this conceptual telescope depended on about 10 technologies that hadn't even been invented. But over time, the project moved forward. And this month, NASA announced that all the prototype technologies had been reviewed and approved by an independent panel. 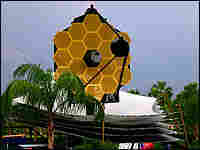 That means the James Webb Space Telescope, named after the second administrator of NASA, should soon become a reality. To show what the telescope will look like, project managers have built a full-scale model that they've been taking around the country. Stockman says it's an impressive sight. "It takes your breath away. It's pretty outlandish," he says. "It's so big, and it's unlike any other telescope I've ever seen." This week, aerospace contractor Northrop Grumman set up the cloth and steel model on the National Mall in Washington, D.C. It looks a lot like a giant ray gun that's about to zap the dome off the Capitol building. But actually, "it collects rays, it doesn't send rays," says Martin Mohan, program manager for the telescope at Northrop Grumman. He says the light the James Webb telescope will collect is very faint, from stars that are more than 13 billion light years away. "And a light year is about six trillion miles, so if you do the math it's a long, long way away," he says. 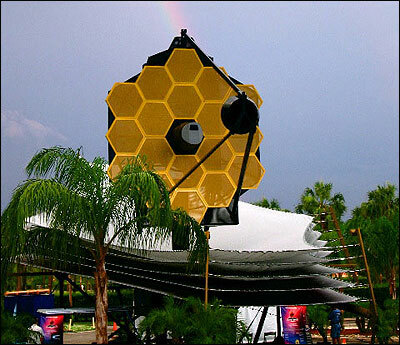 James Webb will see about a half a billion light years farther than Hubble. That means the telescope has to be bigger. The main part of the telescope is something that looks like a golden satellite dish. This is the light-collecting mirror. It will be made of 18 hexagonal pieces that fit together like a honeycomb. "The mirror itself is 21 feet in diameter, and it has an area about seven times that of the Hubble Space Telescope," Mohan says. The mirror sits on top of a sun shield that's as big as a tennis court. It has five layers, and looks like a fancy, silver trampoline. "It's basically like a huge beach umbrella, if you want to think of it like that," Mohan says. "It's there to put the telescope in the shadow of the sun and the reason is, this telescope has to be very, very cold." The telescope will be kept at around 370 degrees below zero, Fahrenheit. It needs to be that cold because it's designed to sense infrared radiation, which comes from anything warm. The telescope could be blinded by warmth from the sun or anything else. So it's going to be sent out into the cold of space, nearly a million miles away from Earth, about four times farther away than the moon. To get there, the whole telescope is going to be folded up like origami and stuffed into a rocket. Once it's in space, it's supposed to deploy itself. If it doesn't, it's going to be too far away to fix, unlike Hubble, which famously had some corrective optics installed by astronauts. Peter Stockman, at the Space Telescope Science Institute, says that some people find this a little worrisome. "We have to constantly reassure astronomers, and people who fund us, that these things are being tested sufficiently on the ground, that they won't go wrong," he says. NASA, along with other space agencies, plans to invest more than $4 billion in building and operating this telescope over its five- to 10-year lifetime. In 2013, if all goes well, the James Webb Space Telescope will head out to its lonely outpost in the blackness of space.